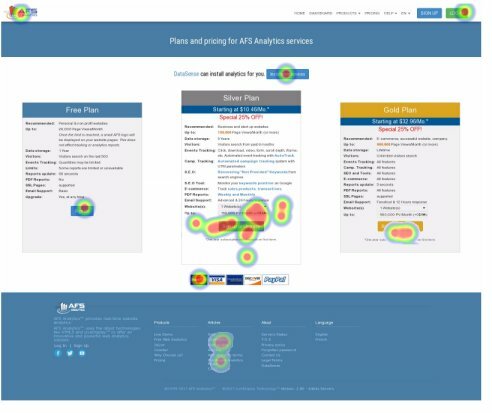 AFS Analytics offers you heatmaps to analyze the behavior of your website’s visitors. Heatmaps allow you to see how your users interact with the pages on your site. Discover the hotspots, view the popular sections, and locate blocking points and areas that are not readily available. All this information will help you optimize the content of your pages and improve your conversion rate. The heatmaps are directly projected on the pages of your site. The results are divided into four different resolutions adapted to the devices used by your visitors: smartphone, tablet, desktop, and large screen (TV). With this system, you can immediately identify the zones to optimize according to the device used by your visitors. Selecting the heatmap management page. In the main menu, select the Advanced menu, then in the Behavior section the Heat Maps option. To create a new map, press the Create a heatmap button. A form appears asking you to set the heatmap’s properties. Note: This may only be part of the address, in which case the following field must be filled in. Use this option to set the address of the page used for the screenshot. This option is useful if you are using passwords protected pages or using the same template for different pages. In this field you must specify the rule to be adopted to select the pages where the data will be captured. Once created, the maps are displayed in a list giving you access to several options. Edit icon: Click on this icon to edit or change the features of the map. Visualization icon: Click on this icon to display the map. Reset icon: Click this icon to reset the map data. Trash icon: Click on this icon to delete the map. When you view a map, you have access to a new toolbar. It allows you to view the results by screen type. TV Screen: Displays data captured from high-definition screens. Desktop: Displays data captured from desktops. Tablet: Displays data captured from tablets. Smartphone: Displays data captured from smartphones. Note: Buttons with a percentage will reduce the size of the map. 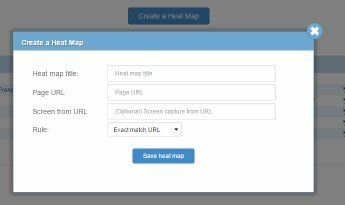 Note: The creation of heatmaps requires a premium subscription plan and version 7 or higher of the tracking code pasted on your website pages.